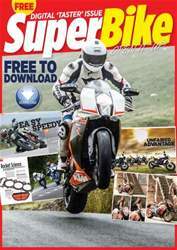 Welcome to the May issue of SuperBike, we've finally managed to get our hands on the super naked bikes, so look forward to reading what we think about the KTM Super Duke R, the BMW S1000R, the Aprilia Tuono and the Ducati Monster M1200. We also managed to sneak a day riding BSB star Shane 'Shakey' Byrne's custom Harley Davidson, it's not as bad as you might think. Chris finally got the call to track test a HRC bike and Shaun gives his opinion on the best security products around. We also rode the new Michelin Pilot Road 4 in Spain. Enjoy the issue.